-It's light and portable.You can do muscle trainning in office, bedroom, or any place you want. Not just in gym. -Contact the skin patch with our soft PU material to ensure a comfortable workout. -When you peel the gel pad off your body for about 20~30 times, you need change new gel pads. 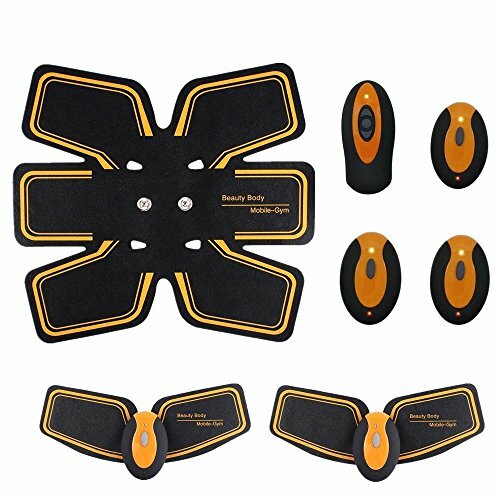 This training machine fits with the body curve and does the effective exercise of the various parts such as abdomen, arm. You can do exercise when you are entertaining, working and so on.Moreover, you can exchange machine and stickers easily due to separate design. Using imported gel, tasteless, anti-allergic, durable performance better. Muscle toner for Man&Women. It's to Tone, Tighten&Strenghten your Abs and body, you can gain tighter stronger muscles and perfect figure after consecutive use of this product for 6-8 weeks (about 20 minutes per day, 5 times per week). Your overall health will improve greatly. If you have any questions about this product by Jaroky, contact us by completing and submitting the form below. If you are looking for a specif part number, please include it with your message.